In 2016, the Environmental Protection Agency performed a survey, and they discovered that people spend about 87% of their time indoors. That’s time spent in their homes, in an office, car, coffee shop, or anywhere else that’s not outside. Truthfully? We think that’s a little depressing, and we have a way to bring the brightness of the world inside your home. 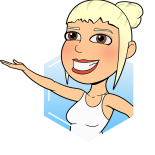 I’m Sherry Sparkle and want to invite you to discover the Sparkle difference. At Sparkle Skylights, we’re all about helping your home become fresher, healthier, and brighter. Why add skylight windows to your home? The reasons are plentiful. Sunlight is one of the world’s best natural disinfectants, and it can slow down the production of harmful organisms such as mold and mildew. Your body needs sunlight to create the vitamins it needs to stay healthy. Diseases such as beriberi and rickets come from lowered amounts of vitamins B1 and D. Lots of sunlight can help our bodies to produce more of these vitamins. Sunlight is a free and powerful mood enhancer, warding off depression, protecting us from seasonal mood changes, and having a positive impact on our immune systems. Bright light helps to stimulate your brain, increasing creativity and productivity. Sunlight helps to naturally decrease blood pressure, which has a huge impact on several aspects of your health. Our family-owned and operated company installs and services skylight windows and solar tubes for homes and businesses, as well as offering a wide variety of windows and accessories. Ready to lighten up your home? For more information or to schedule an appointment, contact us by phone or online today! The Solar Powered “Fresh Air” Skylight Window (available for both deck and curb mount installations) features a solar panel that captures available daylight and uses it to recharge a highly efficient, fully concealed battery powered operator and control system. This operator is the power source that opens and closes the skylight window, negating the need for electrical wiring during installation. 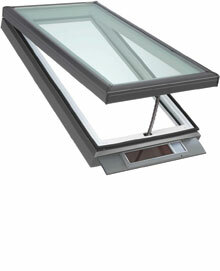 Designed for both deck and curb mount installations, the VELUX Electric “Fresh Air” skylight window is the perfect daylighting solution for overhead applications. It allows for abundant natural light, and with the touch of a button, opens to let in fresh air. 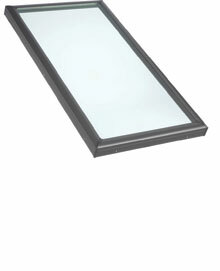 And if you forget to close it, a rain sensor will shut the skylight window during inclement weather. 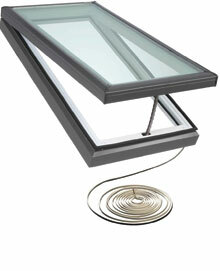 Designed for both deck and curb mount installations, the VELUX Manual “Fresh Air” skylight window enables any home to embrace the best of what nature has to offer. Opening for maximum fresh air, this venting skylight window contributes to a home’s proper moisture balance and comfort level by allowing stale, humid air to be released. VELUX fixed skylight windows, designed for deck mounted installations, are perfect for visually expanding areas such as hallways, stairwells, and other closed-in, dark spaces that can be transformed with light and sky views. They provides an economical choice in creating a spacious home that is filled with beautiful natural light.